(Nanowerk News) Researchers from the Helmholtz-Zentrum Berlin für Materialien und Energie (HZB), in cooperation with colleagues from Oxford and Bristol Universities, as well as the Rutherford Appleton Laboratory, UK, have for the first time observed a nanoscale symmetry hidden in solid state matter. They have measured the signatures of a symmetry showing the same attributes as the golden ratio famous from art and architecture. The research team is publishing these findings in Science on the 8. January ("Quantum Criticality in an Ising Chain: Experimental Evidence for Emergent E8 Symmetry"). On the atomic scale particles do not behave as we know it in the macro-atomic world. New properties emerge which are the result of an effect known as the Heisenberg’s Uncertainty Principle. In order to study these nanoscale quantum effects the researchers have focused on the magnetic material cobalt niobate. It consists of linked magnetic atoms, which form chains just like a very thin bar magnet, but only one atom wide and are a useful model for describing ferromagnetism on the nanoscale in solid state matter. 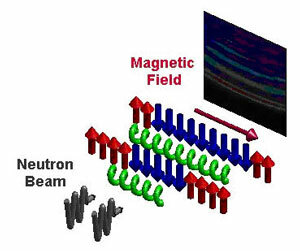 The magnetic field is used to tune the chains of spins to a quantum critical state. The resonant modes (“notes”) are detected by scattering neutrons. These scatter with the characteristic frequencies of the spin chains. By tuning the system and artificially introducing more quantum uncertainty the researchers observed that the chain of atoms acts like a nanoscale guitar string. Dr. Radu Coldea from Oxford University, who is the principal author of the paper and drove the international project from its inception a decade ago until the present, explains: “Here the tension comes from the interaction between spins causing them to magnetically resonate. For these interactions we found a series (scale) of resonant notes: The first two notes show a perfect relationship with each other. Their frequencies (pitch) are in the ratio of 1.618…, which is the golden ratio famous from art and architecture.” Radu Coldea is convinced that this is no coincidence. “It reflects a beautiful property of the quantum system – a hidden symmetry. Actually quite a special one called E8 by mathematicians, and this is its first observation in a material”, he explains. The researchers achieved these results by using a special probe - neutron scattering. It allows physicists to see the actual atomic scale vibrations of a system. Dr. Elisa Wheeler, who has worked at both Oxford University and Berlin on the project, explains “using neutron scattering gives us unrivalled insight into how different the quantum world can be from the every day”. However, “the conflicting difficulties of a highly complex neutron experiment integrated with low temperature equipment and precision high field apparatus make this a very challenging undertaking indeed.” In order to achieve success “in such challenging experiments under extreme conditions” The HZB in Berlin has brought together world leaders in this field. By combining the special expertise in Berlin whilst taking advantage of the pulsed neutrons at ISIS, near Oxford, permitted a perfect combination of measurements to be made.